It is completely intentional that Mr. Anderson has titled his film to phonetically sound like ‘I Love Dogs’ because a twelve-year-old boy’s love for his dog is at its center, but there is much more to it than just that. Anderson creates a deeply engaging and beautifully crafted film, rich in imagination and gorgeous in its visuals, ripe with references to Japanese culture and cinema, and with an undertone that connects to the political issues of our time. It has meaning and is beautiful to watch, but also very funny and a whole lot of fun. I’ve seen it twice and each time I left the theater smiling and with a bit more joy than I had when I arrived. Many have noted the film’s cultural homage vs cultural appropriation issues, most glaringly in having the heroine Tracy be a white American teenager. That’s a mistake which mars the film, as does Anderson’s use of English in what amounts to a marginalization of Japanese language and identity. It’s difficult to fully appreciate all the great things the film has going for it in light of these issues, but I liked many other things about the film. This is Anderson’s second animated feature and both Isle and his 2009 Fantastic Mr. Fox utilize stop-motion animation. The technology has advanced slightly since Fox, but Anderson’s creativity has taken another leap and this might be his most ambitious film yet. 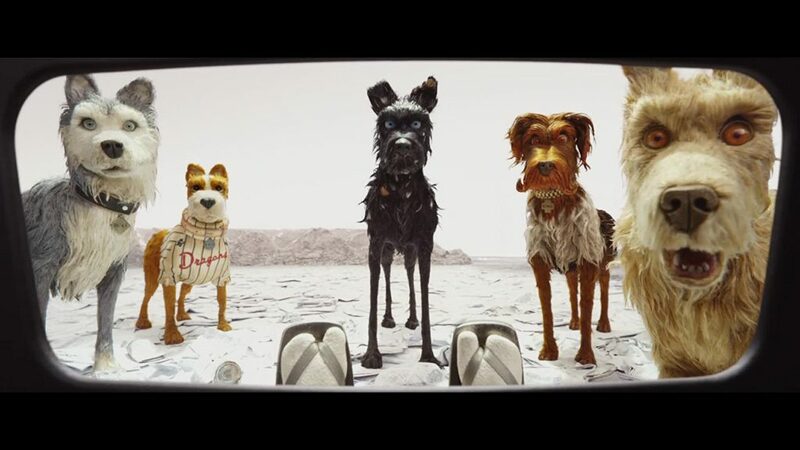 Talking dogs, who we hear speak English (instead of barking), can be funny and witty in that great Anderson dialog way, but are not played for laughs, and each character is very human in its needs, hopes and struggles. That all dogs have been rounded up and exiled (deported?) to Trash Island for extermination by Mayor Kobayashi, the corrupt tyrant of Megasaki City (who only likes cats and hates dogs, blaming them for all ills), reminded me of the ways immigrants and other marginalized communities are being treated in our current politics. That the heroes of the story are activist youth speaking truth to power and forcing change also resonated for me. Setting the story in a Japan of the not too distant future allows for the blending of old and new to great effect. There are many beautiful images in the style of Edo period woodblock prints, Japanese poster art and pop culture and Haiku, all mixed in with the modern technology of Megasaki, including aerial trams which convey people, and move garbage and dogs to the island just offshore. The film also pays deep homage to Japanese cinema, including Godzilla and other monster films, the work of director Yasujiro Ozu, and especially the films of Akira Kurosawa, in how the shots are composed, how the camera moves and the use of focus. The look of Mayor Kobayashi is a nod to legendary actor Toshiro Mifune, Kurosawa’s most memorable leading man. There are even pieces of themes from the scores of Kurosawa’s Seven Samurai and Drunken Angel. Cinematographer Tristan Oliver, who shot Fox and Nick Park’s Wallace & Gromit shorts and Chicken Run, lights and shoots this film exquisitely. There is a scene of the five main dogs discussing plans as they sit inside a cave made from a mountain of discarded bottles of all shapes and colors. The dogs are in complete silhouette and the walls of the cave are a mosaic of color – just stunning. There are so many images that I would want to frame and hang on a wall, and such astute uses of cinematic language to convey emotion and reinforce tone. The scene where the troop is walking through a field of gray grass and stop to hear Chief share some of his backstory is so well blocked and edited, and the breeze wafting through the sea of grass is gorgeous. I can’t say enough about how beautiful this film looks, due in large part to Production Designers Paul Harrod and Adam Stockhausen, Art Director Curt Enderle, and Head Puppet Maker Andy Gent, and each of their departments. Alexandre Desplat scores his fourth Anderson film, having won the Oscar for their previous feature The Grand Budapest Hotel. Mr. Desplat’s use of taiko drums (credit Kaoru Watanabe for the drum sequence in the Prologue) and Japanese instruments throughout the score ground it in that culture, while still allowing room for the quirkiness of Anderson’s storytelling approach. And as usual for an Anderson film, there is perfectly utilized, obscure pop music, this time from the 1960’s psychedelic group West Coast Experimental Pop Art Band, which provide yet another melody that won’t ever leave your mind (thanks Wes). The cast is deliciously good, featuring Anderson stalwarts Bob Balaban (King), Jeff Goldblum (Duke), Bill Murray (Boss) and Ed Norton (Rex), and Bryan Cranston (Chief) rounding out the group of five main dogs. They create great chemistry together, and the ‘we’re all leaders’ rule-by-majority-vote of this pack of Alpha males is hilarious. I’d also see the film multiple times just to hear Mr. Goldblum utter ‘Hey, did you hear the rumor..?’ what seems like dozens of times throughout the film. Other great turns by Greta Gerwig (Tracy Walker), Frances McDormand (Interpreter), Scarlett Johansson (Nutmeg), F. Murray Abraham (Jupiter), Liev Schreiber (Spots) and Koyu Rankin (Atari), with the fabulous Courtney B. Vance narrating. In a climactic scene near the end of the film, Atari makes an impassioned speech in which he says, ‘Who are we and who do we want to be?’ That’s certainly a question for our serious times, even if Anderson poses it under a playful guise. That I can still be thinking about it after the film has ended, and feel a little more hopeful about the future, is a gift I really appreciate. You might too, but I wish he had chosen differently when it comes to cultural insensitivity. Must See. This entry was posted in Cinema and tagged Alexandre Desplat, Animation, Bill Murray, Cinema, Frances McDormand, Greta Gerwig, Jeff Goldblum, Must See, Scarlett Johansson, Wes Anderson.